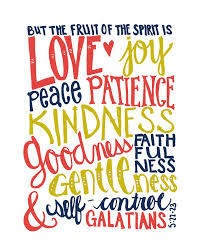 Why are we taught that “the fruit of the Spirit is love”? Because the Spirit of God has come to make our daily life an exhibition of divine power and a revelation of what God can do for His children. In the second and the fourth chapters of Acts, we read that the disciples were of one heart and of one soul. During the three years they had walked with Christ, they never had been in that spirit. All Christ’s teaching could not make them of one heart and one soul. But the Holy Spirit came from heaven and shed the love of God in their hearts, and they were of one heart and one soul. The same Holy Spirit that brought the love of heaven into their hearts must fill us, too. Nothing less will do. Even as Christ did, one might preach love for three years with the tongue of an angel, but that would not teach any man to love unless the power of the Holy Spirit should come upon him to bring the love of heaven into his heart. If we want to pray in power, and if we want to expect the Holy Spirit to come down in power, and if we indeed want God to pour out His Spirit, we must enter into a covenant with God that we will love one another with a heavenly love. I laughed out loud at this. Since I am dead to sin (and alive to Christ) am I one of those “dead guys”? Wonderful!! Um hmm. 🙂 It is a delight to read “dead guy’s” insights. They’ve taught me to think beyond the surface of the Word, and to realize the richness of the depths of all we’ve been given in Christ. I find Andrew Murray an able and stirring teacher, even with the time lapse between us. Agreed, on both observations. Jesus said how we love each other would be our advertisement of faith, but religion holds bureaucracy and tradition as higher ideals. We need more Andrew Murrays and a lot fewer head offices. Andrew Murray wrote some good stuff. Love – without it, we don’t really have anything to offer anyone else, do we? I was introduced to love when I was introduced to Christ. He gave me the Spirit so that I felt it come into me through the top of my head. He said I would then have an always-friend; and I have, to this very day. Here is my testimony. It’s long, I know, but I couldn’t find any way to shorten it. It’s a hard read because one can’t help but take it to heart and see how easily we “slip”. But then, if I was a plant, being “slipped” could be a good thing – new growth. It’s been awhile since I’ve read “Absolute Surrender”, and your post inspires me to dig into it again.